On June 21, 2015 the London-based Guardian newspaper published an article describing the testimony of a soldier who says he deserted the army after his unit was given an order to kill activ ists whose names appeared on two lists. He reported seeing one list given to his Military Police unit that formed part of the Xatruch task force, and a second for a Military Police unit that formed part of the National Force of Interinstitutional Security (FUSINA) task force. 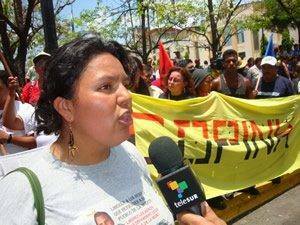 The second contained the name of Lenca indigenous leader Berta Caceres, murdered on March 3, 2016. On June 22 Honduran Defense Minister Samuel Reyes published a response to the Guardian article, claiming that the Military Police did not have a seventh battalion, that the FBI had not trained military forces in Honduras and that the TESON (Troops Specialized in Jungle and Nocturnal Operations) training course did not have US military trainers. However, the Honduran military has reported to local press that the Military Police is in the process of creating a series of ten battalions, each with slightly under 500 soldiers. In December 2014 the military reported that the fifth and sixth battalions had graduated, and by January 2016 it reported that there were 4,000 active Military Police, making it clear at least eight battalions are in operation. 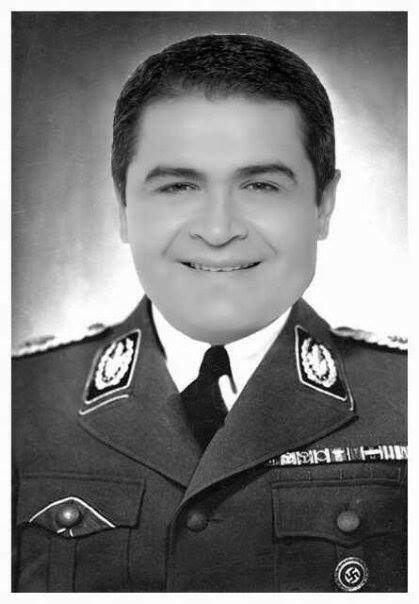 The Guardian article referred to reports of training by the FBI and other US agencies of the FUSINA joint task force in an activity Secretary Reyes himself announced in a press conference with US Embassy personnel on May 13, 2015, as reported by AFP and Honduran media. The Guardian article referred to two specialized training courses, including the TESON course described by the soldier, with US and Colombian trainers. The US Special Operations Command as recently as January 2016 affirmed its support of Honduran of forces. The US Army Rangers helped create the TESON course and have reported support since. Graduates of the TESON training course are considered the elite forces and are spread across military units. On May 2, 2016 five men were arrested for Berta Caceres’ murder, including Major Mariano Diaz Chavez. A special-forces officer, Major Diaz participated in joint US-Honduran military operations in Iraq, and a multilateral peacekeeping operation in the Sahara, and is reported to have graduated from the TESON special-forces training course. Major Diaz was a Military Police for Public Order [PMOP] instructor based in Tegucigalpa. There are two bases in Tegucigalpa which have been used for PMOP training, the base in La Venta and the base in Tamara. In the three weeks prior to Mariano Diaz Chavez’s arrest, the 53rd Brigade of the Florida National Guard conducted training operations with soldiers and the TIGRES police unit on the base in Tamara, potentially working with Major Diaz. When the Central American Regional Security Strategy of the System for Central American Integration (SICA) was announced in April 2011, the Inter-American Development Bank and US State Department announced creation of a “Group of Friends” of the initiative. From this time forward, a program of counter-insurgency policing began to be implemented in Honduras, coupling the creation of “stabilization” police forces—FUSINA, the elite force TIGRES and the Military Police — with so-called “community policing”, the stated goal of the constantly failing police reform efforts. On August 24, 2013 the law creating the Military Pollice for Public Order (PMOP) was published, authorizing a military force of up to 5,000 soldiers dedicated to civilian policing. Upon passage of the PMOP law, the National Defense and Security Council (CNDS) created the FTCCI, and in February 2014 the CNDS created the National Force for Interinstitutional Security (FUSINA). The law mandated the Military Police to operate as part of the Combined Interinstitutional Joint Task Force (FTCCI), with embedded judges with national jurisdiction, a figure created in June 2011. The PMOP law, along with a February 2014 amendment, allows these judges to preside over proceedings via internet from undisclosed locations even outside of the country. It also allows them to enter and leave the country bypassing normal immigration processes. Just weeks before the creation of PMOP, Congress passed the legislative proposal creating the elite TIGRES police unit. 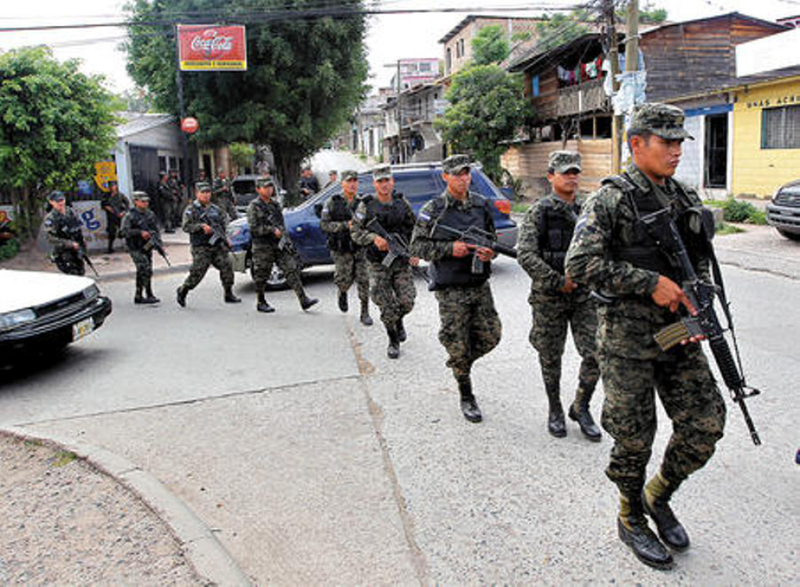 It mandated the new unit to operate with the Honduran military as part of inter-agency task forces. The TIGRES law, passed in June 2013, was the second TIGRES proposal. The first proposal failed to pass congress in 2012 under heavy criticism that it was a revival of the counterinsurgency death squads from the 1980s. The failed 2012 version amalgamated military and police into a hybrid, carabinero/ gendarmerie-style security force, whose command could shift between civil and military authorities. This proposal met with strong opposition, despite announcements that a $65 million loan from the Inter-American Development Bank would be dedicated to supporting the creation of the new force. The response was apparently to divide the proposal into two new agencies, bound to act together via inter-agency task forces — what is today the TIGRES of the National Police, and the PMOP on the military side. Over the past three years the Honduran Military has conducted a series of training courses to create Military Police battalions, with the stated goal of establishing 10 battalions with a total of 5,000 soldiers throughout the country, each specialized in different operational capacities. The First and Second Battalions, trained in late 2013, specialize in intelligence operations. In January 2013 it was reported that a total of 4,000 PMOP were in operation. FUSINA has also grown quickly. Just two years after its creation, it mobilized 11,000 military, police and other agents in a Holy Week security operation. In June of 2016, the total size of the Honduran National Police forces was 14,500 agents, though plans were announced to reduce that force by 5,500. The planned National Police purge, the latest in a series of failed police reform initiatives since 2011, is under the guidance of a police reform commission, made up of four individuals, including the current Minister of Security and former commander of FUSINA, Julian Pacheco, and lawyer Vilma Morales. The commission lacks legitimacy. In addition to the current scandal surrounding FUSINA, respected police reform advocate and former Chief of Internal Inspections of the National Police, Maria Luisa Borjas, claims Morales made a deal with former Minister of Security Oscar Alvarez to bury a case against former police chief Juan Carlos Bonilla who was facing charges of running a death squad. She was an acting Supreme Court Magistrate at the time. So-called “stability operations” in Honduras will not solve the problems of poverty and violence whose effects spill over into the United States. Honduras is not in “a transition”; rather Honduras has an entrenched and increasingly militarized political and economic system that uses institutionalized corruption to control resources for the benefit of a small, violent, ruling class whose hold on power was clenched in a military coup seven years ago. Only a strong justice system can dismantle this system, yet the State Department is not supporting efforts to reform the justice system that the Honduran government refuses to accept, like the offer by the Inter American Commission on Human Rights to sponsor an independent group of experts to investigate the murder of Berta Caceres. But even the strongest efforts for justice system reform cannot combat the root problems unless the actors that enable it, including the US government that continues to fund abusive security forces and international business interests that benefit from public funds channeled to them by development banks like the World Bank, Inter-American Development Bank and Overseas Private Investment Corporation, cease to reward the repression and corruption. Until this happens, real community policing efforts will continue to fail, and stability policing agencies will continue to be tools of repression to enforce the interests of the corrupt economic elite that Berta confronted. Annie Bird is a contributor to CIP Americas Program.